Below, you’ll see a botched job one of my students did with a pattern we have in the shop. 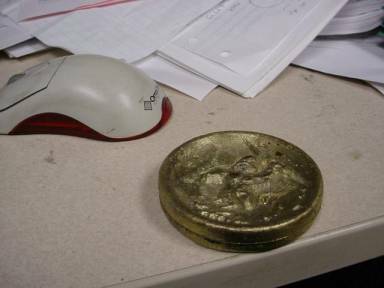 We could speculate about what went wrong for him, but I am really just showing what my principal had in mind when she asked me for a coin. She remembered that we have a pattern for a big coin. She said that the head of our school board would be flipping a coin before homecoming. She thought a big coin would be nice, and indicated with her hands that she remembered it being about 3 inches across. She wondered if we could have a student make one that says Chix on one side and Dux on the other. I agreed that we could do it. That’s how this got started. I work in Grand Rapids on Thursday and Friday evenings and Saturday afternoons. And my grad class meets there on Mondays. I got started on Saturday night, October 1. Homecoming was October 14. Things had to go smoothly. I printed out a logo the right size to fit on the inverted coffee mug. 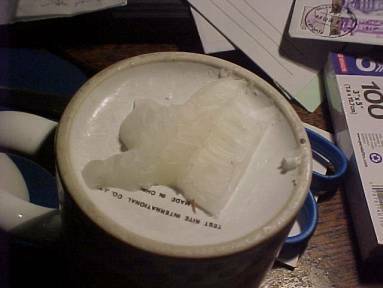 Then I cut the wax away. This took about an hour. 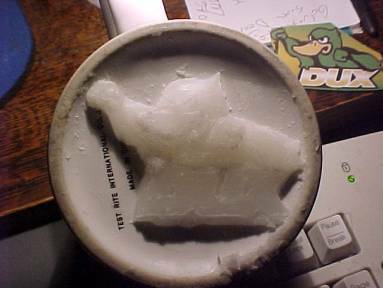 The next day, Sunday, I spent about 5 hours whittling away wax that didn't look like a chick. I could see that this might work. But I was not satisfied with the quality of the detail. I have a lot of respect for real artists. I think they would have been done with both by now. 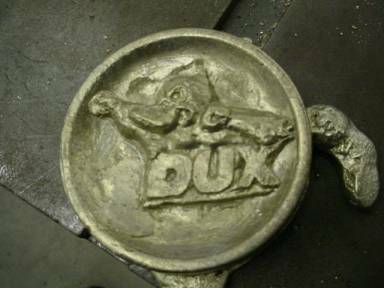 Then, I started the Dux logo. I was surprised how difficult the block letters were. I kept working on the patterns, when time allowed, until Wednesday, October 5. I planned to pour the brass Thursday afternoon. 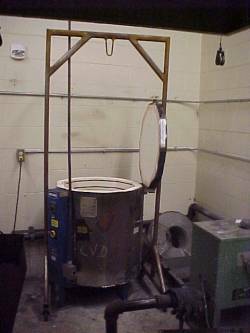 During the day on Wednesday, I replaced the thermocouple in the kiln and got that working. 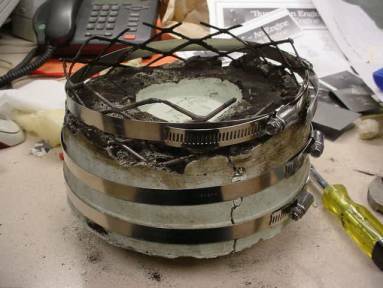 Some heating elements were burned out. I had replacements, but decided not to tackle that job yet. 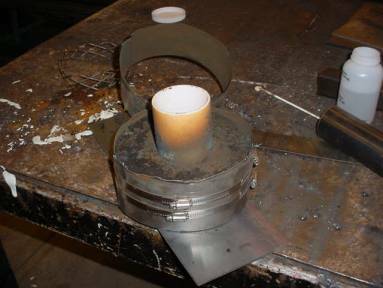 I also welded up a small rack to hold the flasks up off the kiln floor. 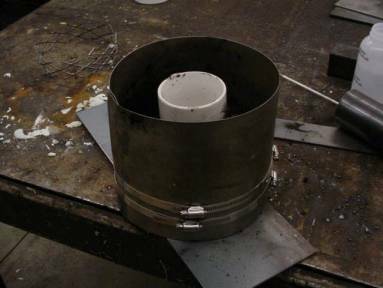 And I welded up a couple flasks, 8” x 8” x 5” deep, out of ¼” plate. 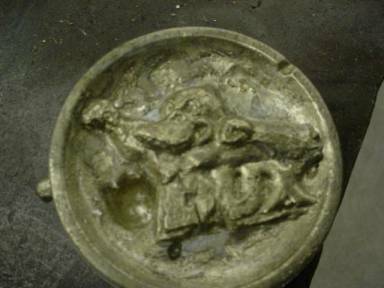 It’s very difficult to discern the surface of the wax in these pictures, just as it is in actual full view. The wax I have is translucent. Dirt from my fingers would mix in, and cracks in the wax would show white through the clear parts. I was constantly rotating the patterns under the light to try to get a fix on the surface. I was surprised how difficult those block letters were to produce. Around 11pm, I mixed the ceramic. 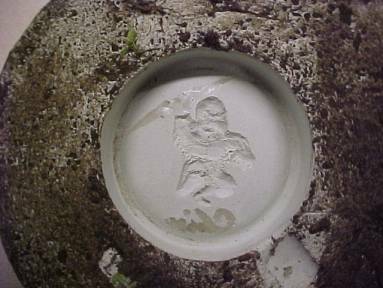 I discovered before, with a test pattern, that simply inverting the mug and pressing into the mud would trap air under the cup. Even a small bubble would be a big problem. I averted this bubble problem thusly: I poured wet investment onto the patterns, as they are positioned above. I tapped the mugs several times to jar bubbles loose from the patterns. I allowed the mud to set for about an hour. Then I filled the flasks with investment and mixed that up with water. I took the mugs with the half-inch or so of set up investment attached, and inverted them into the flasks. I allowed this to set for another hour. So, about 2am I pulled the mugs out of the investment to see what kind of impression I had. I was pleased. This picture does not show detail as clearly as you would see in real life, but it turned out adequately, I thought. You can see a couple small bubbles, but I could chip off the resulting metal after casting. 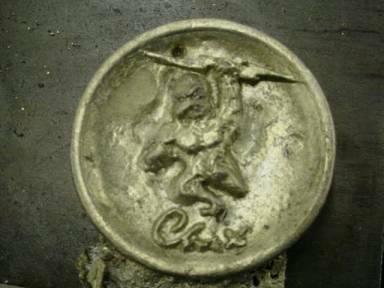 With the one below, you can see that some of the wax pulled off and stayed in the mold (text and part of the lightning bolt). I figured I could just burn this out and that I wouldn’t need the wax pattern after my pour. I took these to Zeeland on Thursday morning and heated them in the kiln at 300º. I expected to have to cook at this temperature for at least five hours, to dry out the molds. 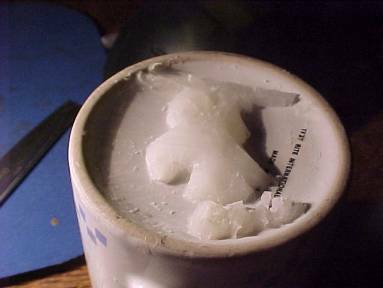 It would take a little longer to burn out the wax. So, I was expecting to put off pouring the metal until Friday. After a couple hours, I looked inside. What I saw stunned me. It was like an evil trick. 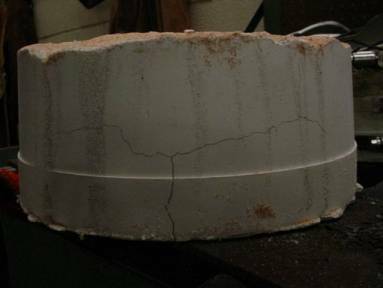 I've had cracks before, but only with blocks that were so hot for so long (30 hours) that the steel burned away around the mold. (I usually use 18 gage). This was only 300 degrees for only two hours, and the cracks were only in the most critical place. Frustrated, stunned, baffled. I was too tired to panic. (Three or four hours per night is what sleep I've been getting lately.) 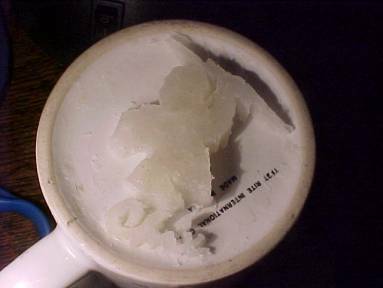 I might have time to rework the wax and try again, but I needed to know what went wrong. At first I suspected the investment. But that didn't sound reasonable. Maybe I used more water this time, but I couldn't think of anything else I did differently. Hmmm... After an hour or so, I realized what caused this problem. It was the layers I produced by mixing the ceramic twice. They didn't adhere! The thin layer I laid on the pattern buckled loose. Of course! Even though time was running out, and I wouldn't be able to do any more work on this project until the weekend, I was much relieved to know what went wrong. I picked up a can of silicone spray. I'd try that as a release agent. I work late in Grand Rapids on Friday, as I did on Thursday. Saturday, I work in GR from noon till 2:00. 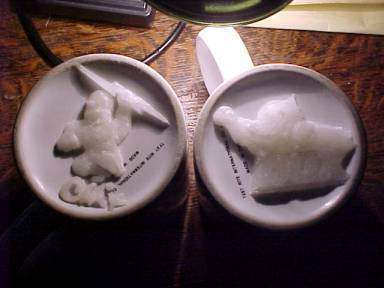 But I found time that weekend to rework the wax and make new molds. 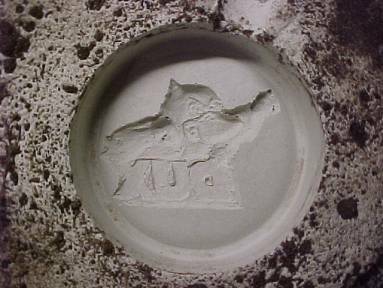 I thought the draft (angle the sides make with the vertical) would allow the mold to fall right out, when inverted after setting. That didn’t happen. I had to cut the pails. I learned that pails from ACE Hardware have a heavy wire around the mouth, under the plastic. I tried something else different. I sprayed silicone onto the pattern before applying the mud. I wanted the wax to release easily. It didn’t help. 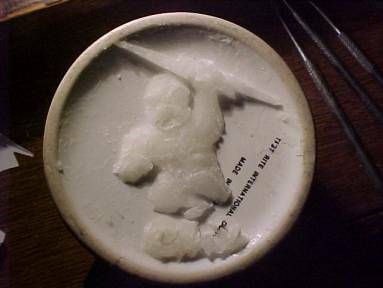 You can see that the wax stuck in the mold. I dug this out to save it, just in case. But it wasn’t worth it. The silicone made the wax hard to work with. The duck turned out pretty good – for a second try. These are both second tries. 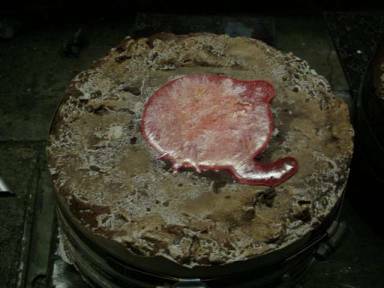 I wouldn’t have expected the wax to do more than a single mold. I was going to race down to Zeeland on Saturday, but decided to wait until Sunday. I had time. The homecoming game wasn’t until Friday. You see (above) the crane I made three years ago for my pig Peg. It’s on wheels. I’m using it to hold the kiln door open. 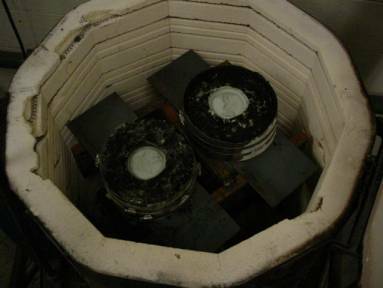 Some of the hardware and most of the heating elements to the kiln have been ruined by thermal shock. 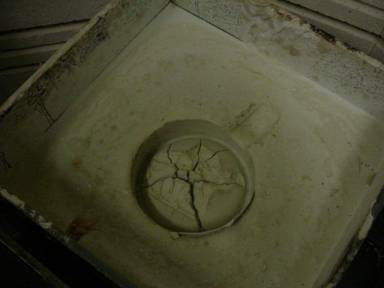 I understand that opening the door to a hot kiln is destructive. It is also probably not right to keep turning the thing on after it shuts itself off, as it does when it reaches its set temperature (for me, usually above 1,500°). When I retuned on Monday, I kicked the temp up to 500°. At the end of the school day, I figured they must be dry. I was, however, a bit uncomfortable about color. I remembered this stuff turning white, and mine were darker than that. I figured that the dirt might have discolored things. I discovered the truth the hard way. I got a student (Bill Machiela) to help me pour the brass. As soon as we filled the first mold, I could tell we had problems. The metal was agitating. Steam was bubbling up into the metal. 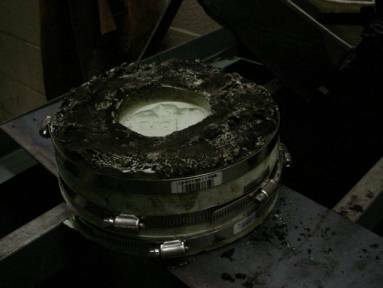 I had us spill the rest of the metal into billets and put the other mold back into the kiln. I raised the temperature to 750°. You can see the sad results below. The black spots are holes left by steam. The one behind his head goes almost all the way through. So, I needed to make a third mold for the duck. This was Monday. 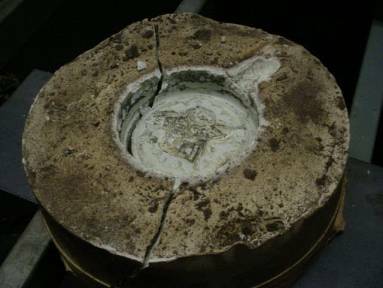 The mold cracked with the hot metal, but didn’t spill any. 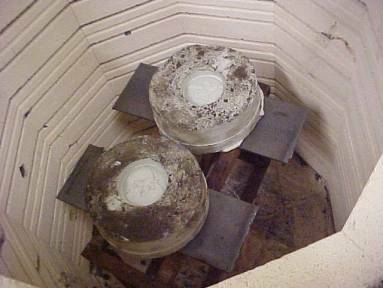 When I left school for my grad class, I looked into the kiln. I noticed the mold was turning white. I was glad to know what the problem was, and that I could trust that dark molds were not dry. After my evening grad class, I went home and (at 10 PM) worked up the wax for another duck pattern. Working with that silicone was a problem. I wished I hadn’t tried using it. 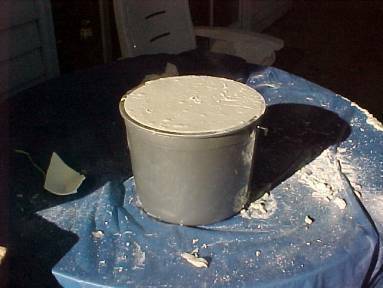 Then, I went outside and mixed up another batch of investment in another pail. In the morning, I loaded all my stuff. In case of another problem, I wanted to have everything at school. 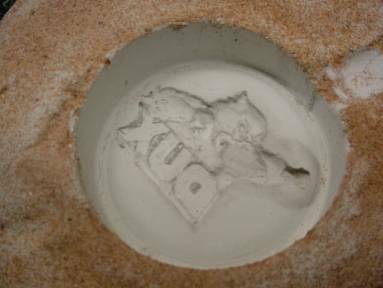 On Tuesday, I put the new duck mold into the kiln with the chick mold, and turned the heat back on to 600° (the kiln shut itself off). I waited until the end of the day to pour the chick mold. 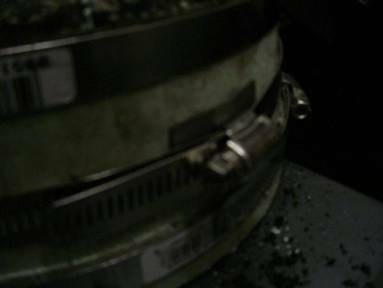 I was a bit concerned because small parts of the mold looked dark. 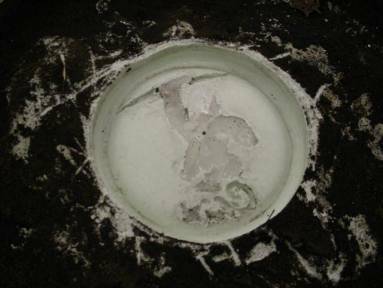 But I reasoned that it couldn’t possibly be damp after two days in the kiln at temperatures ranging up to 750°. I talked about it with some students, but decided to pour. You can see that I had the same problem, although not as bad. There are holes, and a lot of the detail is missing. I was feeling desperate. 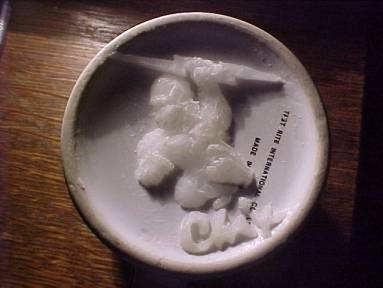 I needed to make another chick mold, and the wax was getting real hard to work with. I also was afraid of cracks at the high temperature. I thought I would reinforce the next mold, to be safe. I bent up some expanded metal. Then I put it in the pail. This looked smart. You can see the dirt in the wax – I’ve reworked this too many times. It looks worse each time. I called Michelle (about 8PM). 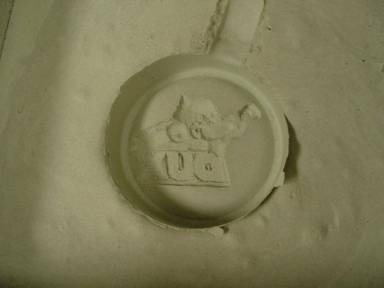 She thought I would be smart to make a spare duck mold too – in case something happened to the one in the kiln. I agreed. It would take me another hour or two, but I better do it. I decided to make a spare chick, too. I would mix the mud for both at the same time. 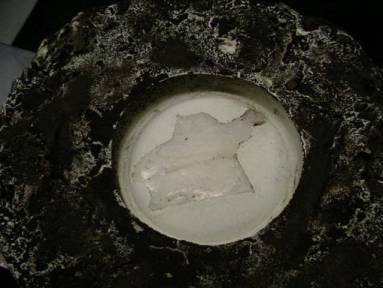 While working on the duck wax, I noticed that a crack developed along the top of the new chick mold. 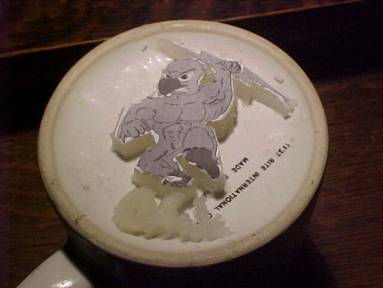 I didn’t realize what was going on, though, until I cut the mold out. 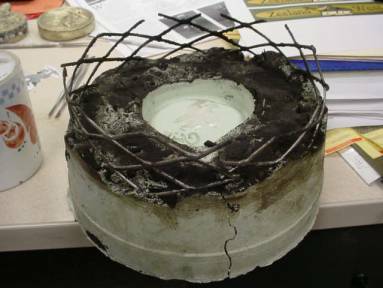 The “reinforcing” actually caused the mold to break. And it wasn’t even hot yet. You can see that hairline crack entering the light part, to the right. This looks bad. I had already thought about making yet another chick mold. But the wax is getting real bad, with all that dirt and silicone. 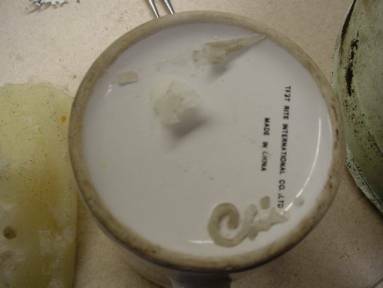 This is what was left on the mug. I got it back together again. I mixed up mud for another mold. I’m loosing track of how many this is. 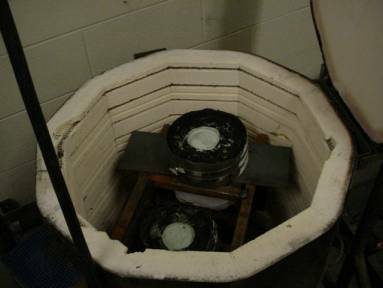 Let’s see.. there’s a duck mold in the kiln, and I’m making another one for a spare. Then there’s this messed up one and I need a spare now for this too. I reworked that wax. This is getting hard. I was out of pails, so I made one. I’m using a spot welder, below. Right after pouring the mud into the last two molds, I ran to Lowe’s. I got there just as they were closing (10 PM) and picked up a bag of hose clamps. This actually looks better than anything I’ve tried. I probably should have done them all like this. I cut the steel off with a plasma cutter. That was stupid. I got the cup real hot doing this. It fused with the investment and I had a lot of trouble getting it out. 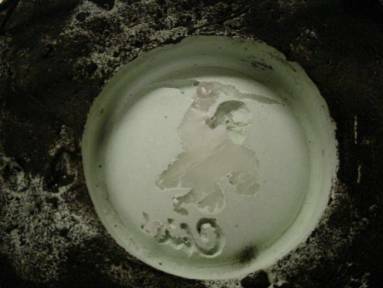 I took a look at the duck I still had in the kiln. After heating it up, (and opening the door) I noticed cracks. I wanted to put some hose clamps on it, so I let it cool and took it out. Then I saw lots of cracks. It was just too fragile to mess with. I put it back in and decided to try and see what happens. I do have a spare now. This is the same cracked mold. There's a crack around the ring the mug made, to the left, but you can't see it in this picture. I could tell you what the dark color around his glove means. 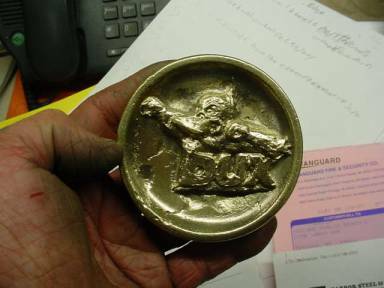 This is the last duck mold. The last duck mold has no reinforcing, so I put clamps around it. I'm afraid that they will dig in and break the mold as it heats. I put steel shims under the turn buckles. Here's my last duck mold, again, ready for the kiln. I had to make another rack because I'm cooking four, not two, molds. Here we are, all loaded up. This is Wednesday. All I'm doing today is cooking those blocks. I expect the heating elements to burn out about 3pm. Then I'll have to scramble all night, trying to wire a kiln that's too hot to touch. I wonder what other people do for fun? So… I had a hard time getting out of bed on Thursday. I expected another long, stressful day. 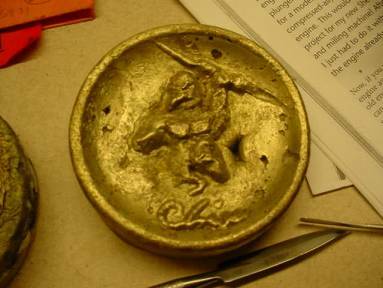 I had arranged for a substitute for the evening in GR, so I could stay at Zeeland and finish the coin. This was my last night before Homecoming. Actually, I had entertained the idea of coming home after school and going to bed, and then getting up at 3 AM to finish the coin. That way I could dry the molds in the kiln a bit longer. Michelle helped me out of that idea. I might need more time after pouring and should probably start sooner. When I got to school in the morning, I glanced in the kiln. I didn’t want to let cold air in and chance cracks so I took a quick peek. The kiln was actually quite cool. After shutting the door, I realized that the mold I saw looked pretty white. That was very encouraging. Then I wished I had looked closer for cracks. I didn’t want to open the door again. What difference would it make anyway? I turned up the dial to 1250°. It took quite a while to get up to temp and shut off. I probably should have switched out those burned elements. After school, I turned it to 600° and was surprised that it had to work about 20 minutes to get there. The thing must cool down fast. I wanted the molds to be at 600° when I poured. I would turn it on at 600° again when I started to cook the brass. I planned to pour around 9 PM. That way the molds would have a good chance to dry and I would be able to machine the castings and weld them before too late. So, then, I would start the furnace around 8 PM. I took an hour nap in my car after school. 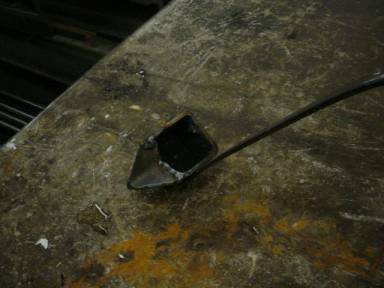 When I came back in, I made a ladle. I couldn’t pour from the crucible, like I always do, because I would be alone this time. I cut some square tubing and welded it to some flat steel. Then I thought it should have a spout. The plasma cutter is fun to work with. It cuts steel just like a razor cuts paper. Welding is fun too. This looked good. But it actually didn’t work so hot. It dribbled the metal out too slow. I was afraid the little dribbles would freeze before the mold was filled. After the first cast, I just spilled the metal out the back. That was faster. While I was waiting for 8:00, I started to machine the ugly, screwed up slugs. I wanted to practice and see what problems I might have. Actually, things went pretty smoothly on this part. 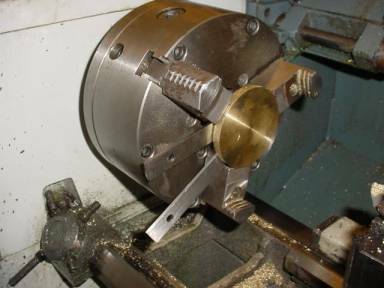 Above, you can see that I switched the chuck jaws around to hold on to the bigger diameter metal. 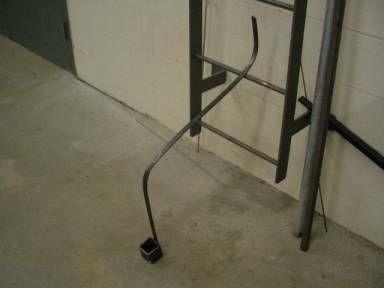 And that I’m using parallel bars to hold the slug away from the chuck. You wouldn’t want to turn on the machine with them in there. I got the slugs as thin as I could and matched them up. Next step is to stick them together. I thought about epoxy, but welding them would be best. 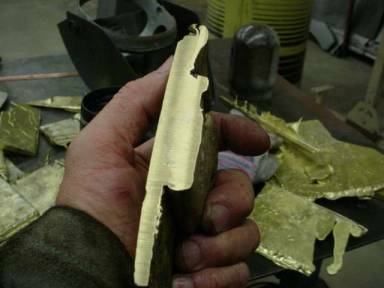 I’m not real experienced with welding brass. But it’s not as bad as aluminum. It’s rather violent when it gets hot. 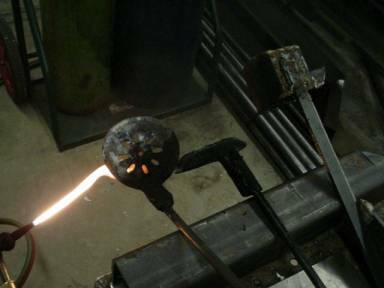 I learned before that it’s best to ignore the noise and smoke and flying stars, and feed the filler metal in fast. I’m going to need to weld my pig Peg, so I thought I better practice here and now. 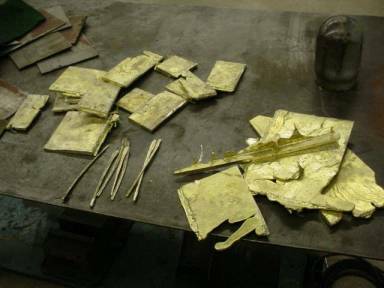 I welded up a cookie sheet, of sorts, and poured some brass into it. I did this the other day. Tonight I sheared it up into practice pieces and some filler metal sticks. 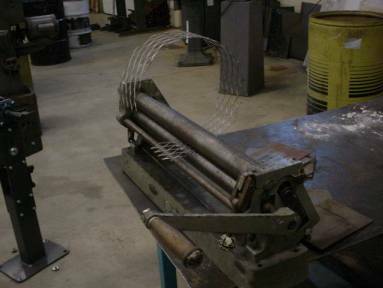 I have brass filler rod, in the shape of heavy gage wire, but, when I weld my pig Peg, I’ll want the filler color to be exactly the same as the casting. 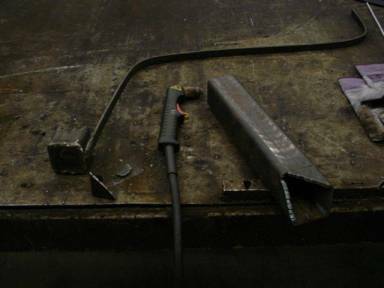 Tonight, I want to see how these shears work in place of the filler rod. I was pleased at how well it worked. This is what the cookie sheet looked like after pouring hot metal into it. I used this side for 3/8” thick sheet of brass. The other side gave me a 1/8” sheet, for the filler metal. You can sort of see how deformed the cookie sheet got from the heat. I probably won’t use it again for anything. Like I said, I was pleased with how able I was with the welding. I stuck these two pieces together in an edge joint, and figured that was easy enough. I was confident enough to go right for the coin. So, here’s what the practice slug looked like after welding and sanding. I’m satisfied. I’d been stalling long enough. My stomach felt sick from the prolonged stress. I tried not to think of what was coming next, and to forget about how important this had become to me. I loaded the crucible with the prettiest brass I could find and started cooking. After this melted, I added more. 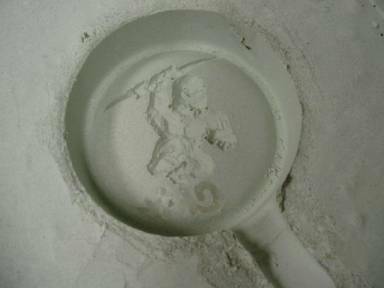 I didn’t want to have any problems getting that ladle full of pretty metal. I didn’t want to get a cup full of slag because the thing wasn’t full enough. The slag floats. 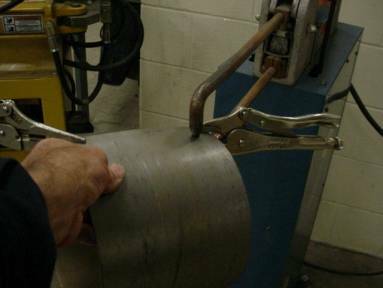 When you add metal to an already melted charge, you need to be careful. Any moisture can cause an explosion. 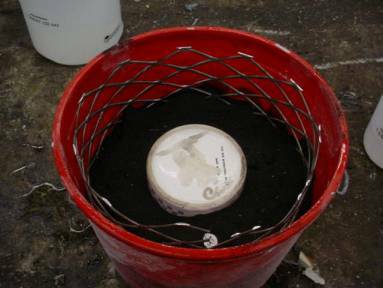 Moisture, just from the air, will be found in abundance in the slag that freezes on top of the bars we pour. 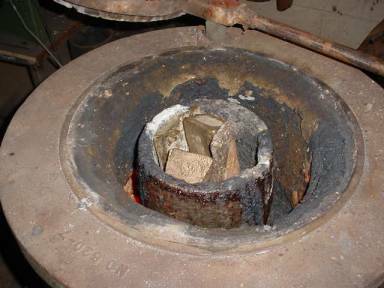 I always hold the metal over the mouth of the furnace for a brief time. It doesn’t take long. And I make sure to suit up with leathers. 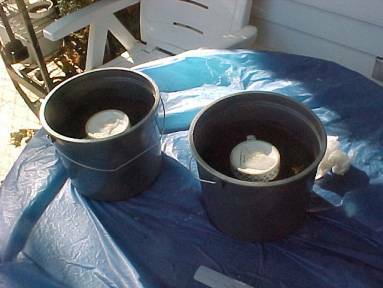 What I’m doing here is coating the steel skimmers and ladle with soot. 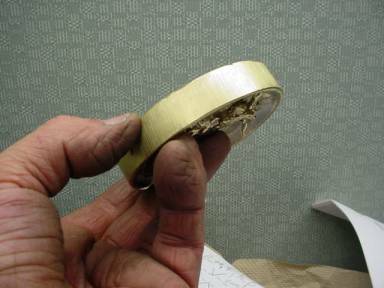 If you don’t do this, brass can stick to the steel and it’s very hard to get off. These skimmers are new. They cost almost $50 each. You only use them once in the metal, and then set them aside until you coat them again with soot. I used each of them twice. I wanted to get as much of the slag off as I could. Right after this, I was ready. It was time. I felt dizzy walking across the shop. I tried not to think. 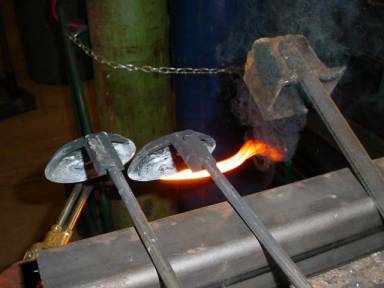 I carefully set the molds out and started dipping and pouring the hot metal. I was surprised at how much force it took to submerge the empty ladle in that heavy brass. 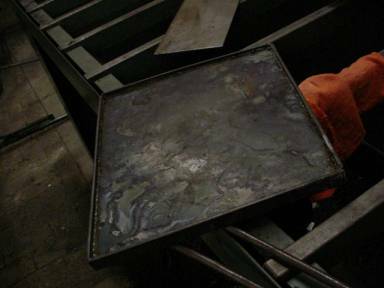 Below, you see some hot metal. I was too late in getting the camera to show you radiation. It always looks so cool when the stuff radiates, all yellow, and then red. I had a hard time getting myself to look at the results. I was too afraid. I needed some good news. 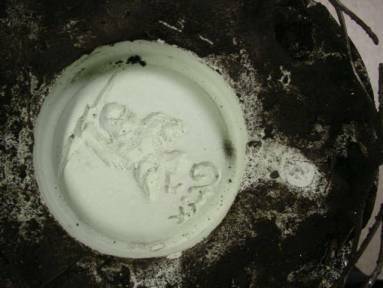 I figured the likeliest place to find it was the mold that had been in the kiln the longest. This was the one with the cracks in it. My problems had, up till now, been from water, not cracks. 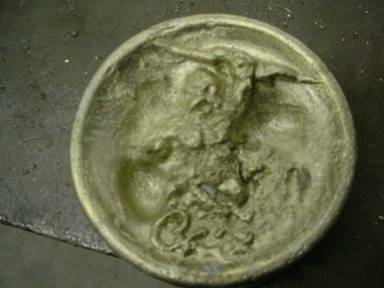 I had notice the metal agitating in that particular mold, after pouring, but I couldn’t imagine that it would still be damp. I thought that maybe gas was escaping from a crack. That couldn't be good, either. 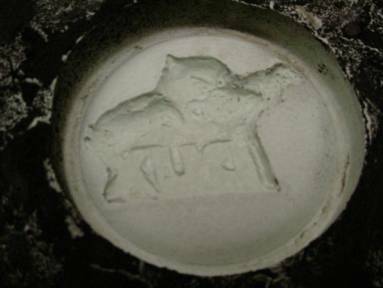 But, it had been in that hot kiln since Tuesday morning. This was Thursday evening. I never suspected moisture. But you can see that I had big voids from steam. My heart sunk. Since I was sure that this was as good as I would get, I had really no hope left. I figured the rest of the night would be a clean up job. 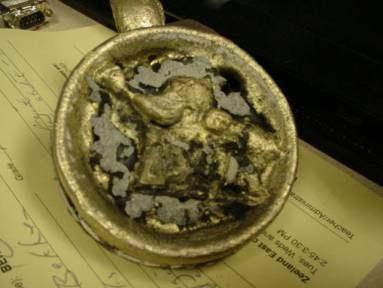 This is the second casting I looked at. Although this is far from the quality I expected when I started this job, it was a big relief to see the duck and lettering so clearly. There are voids and detail is missing, but I can live with this. Now.. how about the chick? I picked the chick mold that I thought was most likely to be successful. I picked the one without the reinforcing and big crack. My heart sunk again. We have more deep voids and lost detail. I lost all hope again, and felt rather panicky. We were so close. I spent the next couple hours machining and welding. Then I polished the thing. It doesn’t look good, like I wanted, but it will work. I can go home. Here's what happened. 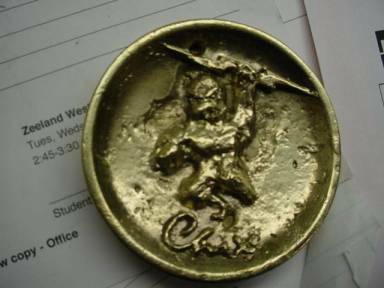 At 7:00 AM on Friday, I emailed my principal saying that I had a coin for her, but that I wanted to work on it until the end of the day. 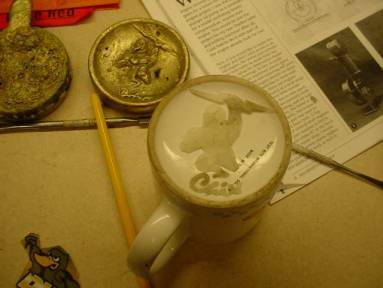 Then I got a student with aptitude to produce several sand molds, using the waxed up original as a pattern. We cast them and laid them aside. I ran the original down to my principal, and left the new ones in the shop. After school, and after the homecoming pep assembly, I returned and cut the gates off and polished the best looking one. It wasn't bad at all. It was yellowier and, although lost more of the detail, lacked the ugly voids. I found the principal and gave her this one, too. I said that she could decide which one looked better and use that. 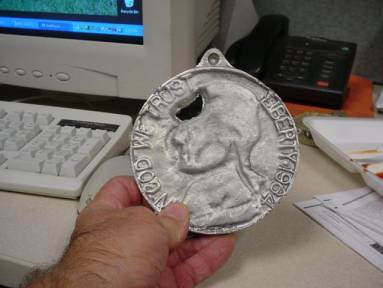 She said that the school board president had called early and wanted the coin so that he could practice flipping it before the big game. As soon as I gave her the first one, she sent it off to him. I thought that was cool, that the president of the school board was asking for the coin, and that the principal rushed it to him. It was an important thing. If I had failed completely, like I almost did, it would have been embarrassing. But this turned out ok. I'm quite relieved. I wish the quality was better, but I'm just a shop teacher and an amateur artist. So what the heck!